London has a lot of history, of course, and a lot of blue plaques have been erected by English Heritage over the years to mark the locations of its famous people and deeds from times past. Local history societies and borough councils have also added their own plaques, of various colours, so that some parts of London (for example, Bloomsbury with its academic tradition) is a rich source of blue plaques, some rows of houses having several plaques along their length, occasionally even beside neighbouring doorways. Open Plaques is gradually assembling a user-contributed database of plaques from across London, the UK and indeed the world, and there are numerous other projects and books on the subject. One of these, The London Blue Plaque Guide, written by Nick Rennison, is now in its fourth edition, as it attempts to keep up to date both with new plaques being added, but also existing ones disappearing and sometimes even relocating. If you are on a plaque-spotting trip to a London neighbourhood, or simply want to know about the plaques are nearest to you (and exactly where they are) then the London Blue Plaque Guide, coming in at over 300 pages, is an appropriately authoritative guide. The plaques are presented in alphabetical order based on the surname of the person featured, each plaque gets roughly a quarter of a page (there are nearly 1000 in London), detailing the name, inscription on the plaque, and – in almost all cases except for the very obscure – a paragraph serving as a concise obituary of the person concerned. This provides the context and detail behind the plaques, which themselves are typically a maximum of 10 words. The equivalents in other countries, such as the National Historic Landmark signs in the US, do provide the detail which an interested passer-by craves but which the London blue plaques here miss – and the book fills in. The book also has three indices – by map number, by profession and by postcode (with a few additional ones listed by locality where the postcode was presumably hard to determine). The map index appears at the beginning, and it is a slightly confusing process to first link the map number with the plaque numbers on each map, using the first index from these, the entry by surname – but the indices don’t contain page numbers, so you then have to flick through the rest of the book as it moves through the alphabet! The maps themselves are crisp and clear, shown in black-and-white. They are simple – they only include the major roads, as well as the locations of the plaques themselves of course – but many of these are not on the major roads shown, so a certain amount of guesswork is necessary to pin down how to get to the shown plaque from the road network, this is made more tricky by nearby plaques being offset slightly so that the numbers don’t overlook on the map. The maps also only cover central London, there are a small number of blue plaques in London beyond the area. They are included – but don’t have a corresponding map. For example, my local plaque is notoriously difficult to find but there is not a map for it in this book because it’s not in central London (it’s the plaque commemorating Roe’s first powered flight from a plane built under the railway arches that cross Walthamstow Marshes). All in all, a wonderfully comprehensive book, particularly with interesting detail on almost all the people commemorated on the plaques – but let down a little by the slightly confusing indices and oversimplified maps! 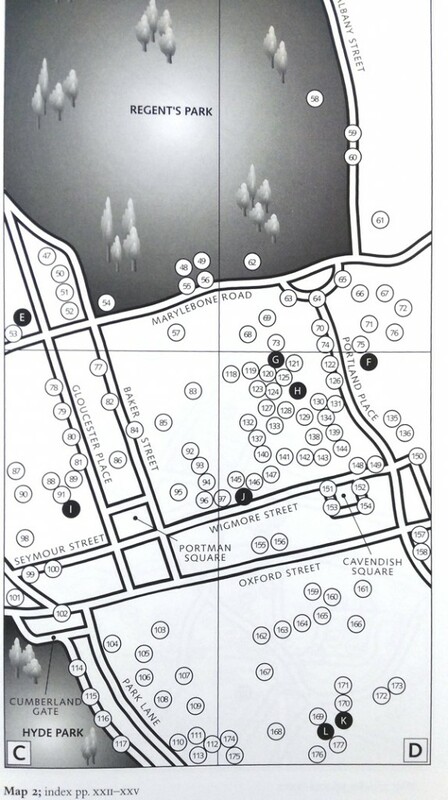 Still a useful guide – but check OpenPlaques too for more detailed mapping and photography. Thank you to publisher The History Press for a review copy.